On Marrakech’s Jemma el Fna Square amongst the orange juice stalls and story tellers you will find stalls with CD’s testifying to the popularity and importance of Morocco’s contemporary music scene which began with the accession of King Mohammed VI in 1999 when greater liberalization of musical genre especially for young people who sought music which reflected their aspirations was gradually phased in and supported with musical festivals organized with royal support and sponsorship like the annual Mazawine Music Festival in Rabat, The Gnawa Festival in Essaouria and the World Sacred Music Festival in Fez. Moroccan TV and radio channels also play an important role with live performances. Young musicians are encouraged to perform and Morocco which has successfully fused elements of its ancient Berber musical traditions with modern music such as Chaabi, Hiphop and Rai and Rap. This has not been without controversy with orthodox Islamic opinion and 14 young members of a heavy metal band were arrested for making “satanic music”, though they were eventually released. Rap stars who make sensitive political comments are sometimes imprisoned. Members of the Islamic led PJD government have also criticized music festivals for corrupting Moroccan youth but generally Morocco’s spirit of compromise wins through despite the tensions affecting the region. Indeed you can see and hear moveable cassette vendors with their barrows playing religious music with other wares for sale on the main Avenue Mohammed V in Marrakech’s ville nouvelle, Gueliz. Traditional Berber folk village music called Ahwash, is very much alive and is on display in July each year at the National Festival of Popular Arts at the Badii Palace in Marrakech. The music performed by professional musicians called Raiss includes comedy and dances in their performances. Two famous traditional musical bands are Bachir Attar’s Master Musicians of Jajouka who originally met with Brian Jones and the Rolling Stones in 1969 and recorded with them. Their music celebrates the pagan rites centered on the figure of Boujeloud who has been likened to Pan. They perform regular concerts in Morocco and abroad including the United States and Germany playing with international musicians. They recently featured in Anthony Bourdain’s “Parts Unknown “ program on CNN. 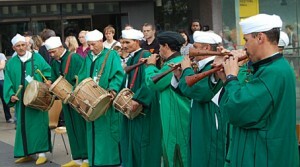 The other traditional band is the Daqqa of Marrakech who perform a ritual dance for the religious festival of Ashura. 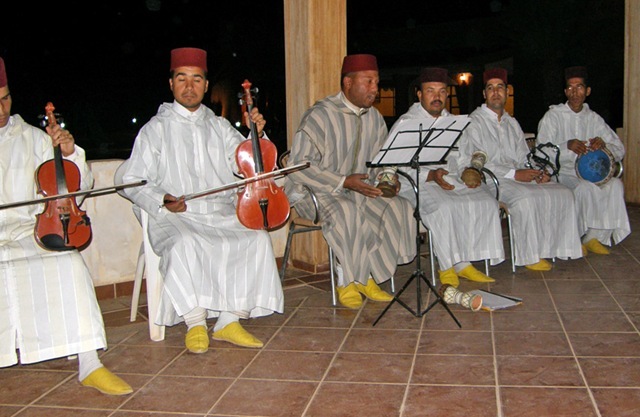 Chaabi is a popular music descended from Moroccan folk music. Originally performed in markets, it is now performed during celebrations or meetings. Chaabi songs end with a swift rhythmic section and syncopated clapping. Modern instruments like electric guitars and buzuks are also used as well as lutes and a drum. Andalusian classical music called Al Ala was brought to Morocco following the Reconquista in Spain when Muslims and Jews were forced to leave. It is an urban form of music which is highly popular and performed with large orchestras frequently on TV and radio. 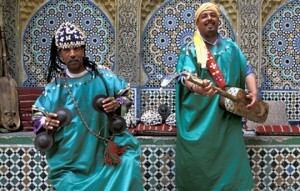 Jewish musicians had a profound influence on Al Ala.
Gnawa was brought to Morocco by Sub-Saharan Africans and later became part of the Moroccan tradition. Much of the modern fusion draws on Gnawa and the annual Essaouira Gnawa Festival is now broadening its musical performances to include a more contemporary repertoire. Classical Malhun music which translates as “gift” or “inspiration” is Arabic in origin and is derived from Sufi inspired Arabic Andalusian poetry. 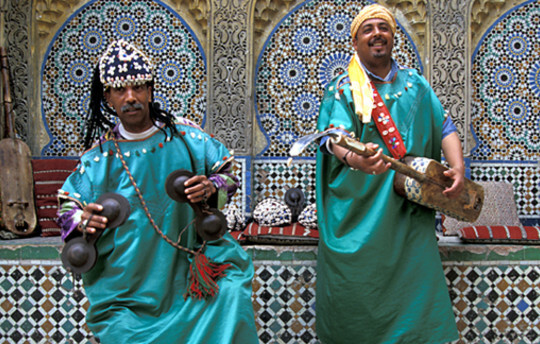 Sufi Brotherhoods (tarikas) are widespread in Morocco, and music is an integral part of their spiritual tradition. The purpose is to induce a trance state which inspires mystical ecstasy. Leading Sufi Brotherhoods include the Derkoua, Hamadasha, Aissoua and the Jilala. Modern music includes Rai which is associated with Algeria in the international music scene, but Morocco has produced its own stars lincluding Cheb Mimoun and Hanino. Other genre include Hiphop, Electronica and Fusion, which draws on Gnawa, Jazz and heavy metal. Casablanca is a major center for contemporary Moroccan music. Pirating remains a concern for Moroccan musicians as it is difficult to establish copyright for music performances and CD’s, although Morocco has an intellectual property rights law. In Marrakech an English music producer Nick Wilde set up Marrakchi Records a record label, music publishing and artist management company to support young Moroccan musicians. Marrakchi Records provides a management service for Moroccan musicians and promotes them thus helping to establish them in the fast moving contemporary Moroccan music scene. It covers all genres from Rock, Hiphop, Electronic, gnawa , blues and African music. Artists who have successfully produced albums with Marrakchi Records include Caravane, Blue Medina, DJ Haze, Mwanssa, Chaabi and Nisrine.